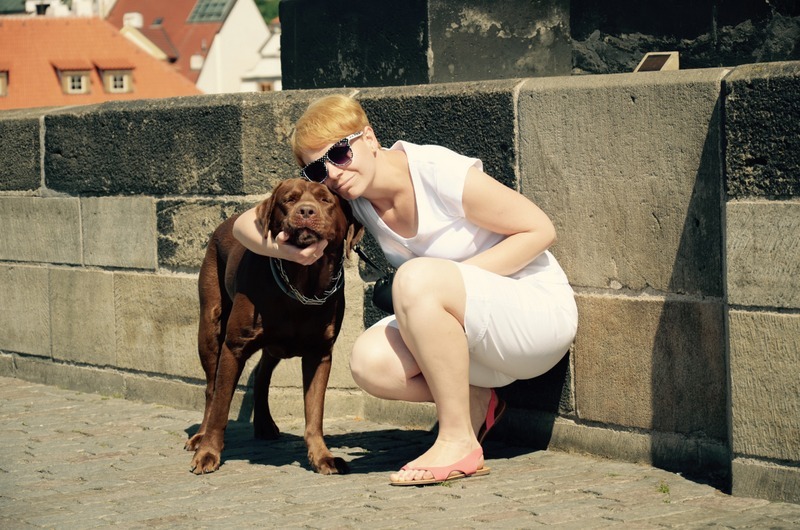 I’ve been to Prague a few times before, but this was Ania’s first time in the Czech capital and we took Fado along as well. Having Fado around a city weekend getaway was going to be a learning experience for us, but he passed with flying colors. We rented a pet friendly AirBNB apartment from Khaled (link here), a one bedroom apartment with hardwood floors, a kitchen annex, and located just a 15 minute tram ride from the Prague’s Old Town. It was my first time using AirBNB, and we were pretty happy with our apartment and highly recommend the place to anyone wishing to visit Prague. For Fado the biggest problem that weekend was the sun and the 31°C (88°F) heat. It was pretty impressive to see Fado always find shade even in places we really didn’t see any shade at first sight. We made sure of course he cooled off plenty during our sightseeing. We always carried water and a portable water bowl for him, we made beer stops where he could lay in shade and rest, we allowed Fado to go all out in any water fountain we found, and to top it all off, we took Fado swimming in the Vltava river running through Prague. All these seemed to do the trick and Fado was always upbeat and happy go lucky to be traveling with us. Sightseeing Prague is pretty easy assuming you’re willing to do the leg work required to see all of the historical things the city has to offer. We didn’t really follow any guidebooks but instead just spent our two days walking around and absorbing the vibe. There are a couple of things worth noting that I myself had learned this trip. One; forget about the cash exchange places and simply use an ATM/cash machine to get local Czech Crown (CZK) currency. The currency exchange places are gonna rip you off pretty much anywhere within city limits. Finding that one that doesn’t might take time, so I suggest you take your money from an ATM where you’ll get cash based on international currency exchange rate that particular day. Two: when ordering food make sure there are prices on the menu! We were walking around Saturday late morning when we decided to make a breakfast stop along the way. Menu had no prices but we figured that a couple of salads and ice coffees can’t be that much, right? Wrong! That breakfast ended up costing us 1,200 CZK, For comparison I will add that later on we ate a tradition cuisine face stuffing dinner with two beers, a mojito, and tip included, for 550 CZK. So yeah, make sure you order from a menu with prices. We had a great time and all we really did was walk some 40km around Prague. Here’s a quick video put together by Google’s Photo app.